The Adventures of Champion – western TV show. The Adventures of Champion. AKA Champion the Wonder Horse. Barry Curtis and Jim Bannon. 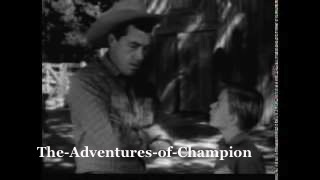 This entry was posted in The Adventures of Champion – western TV show, Western TV Shows Full Length and Free to Watch Online and tagged complete, free, full length, online, watch, western, westerns. Bookmark the permalink.